This Mama Mountain Goat was so cute with her mouth open as though she was laughing or smiling at me. A painting technique called Impasto is used for this MT Goat heavy fur coat. About 6 to 7 layers of paint were used to develop the heavy texture of the goat's winter coat. Paint is laid on an area of the surface very thickly, usually thickly enough that the brush or painting-knife strokes are visible. She is a Miniature and made to stand up by herself,standing in the snow. 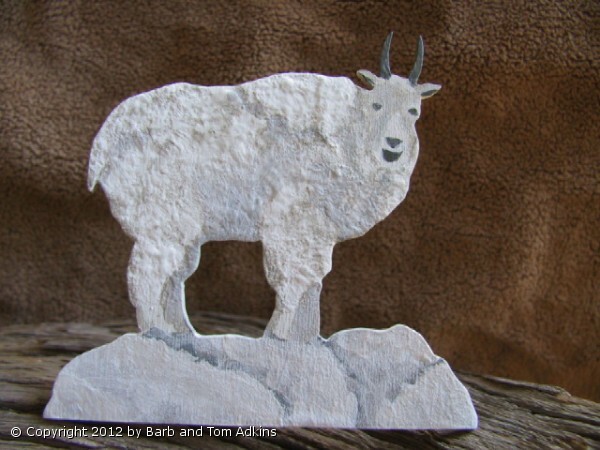 These Mountain Goats would look Wonderful on the Dinner Table at each Place Setting. Mix them up with other animals such as my Mini Big Horns. These are great at the base of candles on a shelf or table or gazing at your from a near by shelf or table. A nice reminder of your visit to Colorado. 1 for $25.00, 4 for $80.00 Consider Mixing & matching all 3 pieces or ordering a Bear or other mountain animal.